When was the last time reading a book left you with a burning desire to read more books? 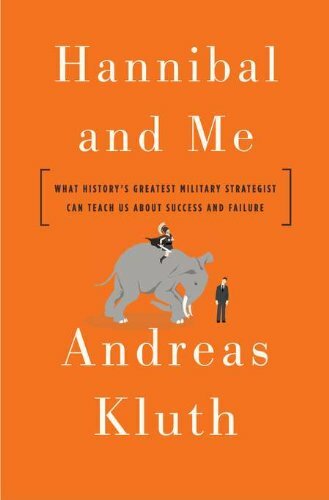 Hannibal and Me: What History’s Greatest Military Strategist Can Teach Us About Success and Failure affects the reader in just this way. Having hung on to Mr. Kluth’s every word, this reviewer closed the book determined to read Jung again, revisit Maslow, and reacquaint herself with Eleanor Roosevelt. “This is a book of stories, some ancient, some personal, some mythical, some famous, some obscure . . . About the archetypes of triumph and disaster, or success and failure, in life” so says Mr. Kluth. Mr. Kluth tackles taboos, boldly reintroducing ideas banished from Western intellectual discourse since the 1960s. He dares, for example, to raise notions like duty—not the tired old just-say-no-back-to-basics-family-values platitudes The Right warms over each election cycle. This is something deeper. Citing Eleanor Roosevelt’s contented old age, he illustrated how virtues such as honesty, integrity, and the ability to accept reality can allow one to turn disaster on its head. Roosevelt, devastated by the discovery of her husband’s infidelity, was eventually able to accept her situation and move on, living her own life in private, reestablishing a new equilibrium in her marriage, and leading an exemplary and inspirational public life. Mr. Kluth suggests that we can all share in Roosevelt’s transcendent contentment and demonstrates that merely by doing our duty—executing our tasks, living up to our titles, and fulfilling our responsibilities to the best of our abilities—each of us may achieve Roosevelt’s level of satisfaction and inner peace. In some ways Hannibal and Me is a synthesis of many the intellectual and spiritual movements since the sixties. As such it risks veering into the banal, or skirting New Age nonsense, but whenever Mr. Kluth approaches this precipice, he retreats in time, turning back to the stories of real heroes. He sifts through these divergent, larger than life characters and draws life lessons to help us achieve our goals and live more integrated lives. One of the most valuable insights he offers, particularly for workaholic Americans, comes from the lives of Arctic explorer Ernest Shackleton and the Roman General and Consul Fabius: there are moments when doing nothing can lead us to ultimate success (Shackleton’s defeating the ice by not fighting it, but flowing with it). At times Mr. Kluth’s tone mimics his employers at the Economist: authoritative and occasionally skirting dictatorial. This is particularly true in the chapter about parents, where he seems to be arguing that parents are destiny. He suggests that through emulation, searching, or rebellion, we live out our parents’ plans for us. Certainly in Mr. Kluth’s case this is true. He recounts the lengths he went to as a young man to thwart his father’s ambitions for him. He escapes his father, delving into the darkest corner of the London School of Economics library. What he finds there induces goose bumps. Mr. Kluth distinguishes between the young heroes, Hannibal, Einstein, Tiger Woods, and the late bloomers, Eleanor Roosevelt, Paul Cezanne who “thrive on nuance, subtlety, and complexity.” He demonstrates that years spent searching and accumulating experience often eclipse the kind of explosive, world changing “conquer or die” youthful success: Picasso, Meriwether Lewis, Hannibal. In the chapter entitled Political Death, Mr. Kluth correctly chronicles the way in which the determined mediocre stalk the great, and how with single minded resolve and mean spirited relentlessness, they almost always succeed in bringing them down. He suggests that the great might counter their lessor foes by merely being aware of them. But envy is rooted in the mere existence of greatness in the object of their envy, as well as its absence in themselves. The author shows that Hannibal knows this and had planned an elaborate escape. But his enemies were one step ahead of him. When he fled he found Roman soldiers awaiting him at the exit from of all seven of his escape tunnels. Despite applying his considerable insight, charm and intellect to so many weighty questions, Mr. Kluth deftly avoids deep analysis of why male crisis so often involves betraying wife and family. While simultaneously warning the reader of the danger of underestimating the smallness of people, Mr. Kluth seems to hand cheating husbands and deadbeat dads the perfect justification for their behavior. One can almost hear everyday cheating husbands quoting Hannibal and Me to justify their bad behavior. It may be that there exists a kind of cosmic equation that forgives the Einsteins whose achievements are important enough to mitigate their private failings, but Mr. Kluth doesn’t spell this out. Perhaps he should have suggested an Economist effect: if you’re important enough to be named in the Economist cheating on your wife or neglecting your children you may be forgiven, but he doesn’t. Instead he appears to be providing a rationalization for the everyman to fail at his sacred duty to those who love him. Jillian Abbott has been working for a politician for the past few years. Previously, she was a full-time reporter and freelance writer covering pieces for The Writer magazine, the Washington Post, the New York Daily News, and many other outlets.